There are lots of little tiny parks and playgrounds dotted around, but I will only list those worthy of a special mention/visit. Right in the centre of Leiden, this is an ancient grassy motte with much later castle walls. It is great fun to play in with children, although a head for heights is needed on the way up and if you want to walk round the ramparts. The steps are an adventure but you can go round the steep slope with a pushchair if you are feeling strong. It's doable on a mobility scooter, but only possible with a wheelchair if you have a very good motor or strong person pushing you. Access is through the disabled access gate, but you need to get the key from the café Het Koetshuis - since this doesn't open until 12, if you are earlier than that it's best to get someone to help you just carry the pushchair up the few steps at the bottom. Alas, with a wheelchair you simply can't get in before 12. Apart from the omnipresent smoking teenage Goths, who for some reason like to hang out there, and who mean that it's a bit grubby, de Burcht is great for running around and playing knights and soldiers and suchlike. The view of Leiden is fab but it's quite scary going round the ramparts with several small children, especially the spiral staircase up to the top, and impossible if you also have a baby in a pushchair. Cronesteyn is really lovely and a perfect contrast to town life: real wooded bits to build dens in, and huge open grassy spaces. There's a brilliant bit for muddy splashing and playing,and lots of wild bits to get lost in. There's also a little camp site for exciting mini camping trips. 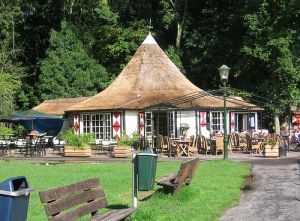 There's now a very nice café there called De Tuin van de Smid (www.detuinvandesmid.nl) which serves all sorts of organic stuff and is very child-friendly, and a nature playground. There are various events and activities such as weaving wigwams out of willow branches. Once you have got used to the bits where the banks slope scarily down to the Singel, this is a lovely place to go and see the ducks (please don't feed them, as it's not good for them or the other wildlife). As usual, there are dog turds, but there is lots of space for games and lots of trees to climb and bushes to hide in. At one end there is a play area with some rather odd futuristic climbing stuff, which nonetheless they seem to enjoy. There are also budgerigars, parakeets and quails in cages, which are a particular favourite outing for really small children, who can happily push bits of grass through the mesh for hours. It is quite a sociable place, as it is visited by so many parents of small children. There are lots of ducks, which are very tame. In the summer there are lots of ducklings. Do beware of the large swans that climb out of the water and try to nick your picnic: not ideal with the smallest children. The other end of the park has good climbing trees, and tons of space to run around. 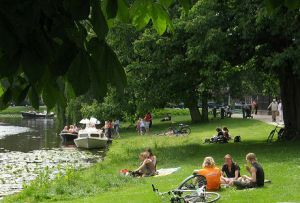 This is the closest Leiden gets to nature, and is really lovely. There are woods to build huts in (although lots of muddy canals to fall in, so keep a good eye on small people! ), a big lake with ducks, lots of trees and grass, and a very nice playground with sand opposite a pretty café with outside tables (www.deleidsehout.nl). It is one of the few places where you can sit and eat lunch in the summer while your children (albeit not tinies) play contentedly. There are also lots of deer and other animals in an enclosure alongside.